Home | Sale Items | Extra Large Pedicure Nail Trimming Perch for Macaws 9.5"
Home | Bird Supplies | Bird Perches | Pedicure and Nail Trimming Bird Perches (Cement) | Extra Large Pedicure Nail Trimming Perch for Macaws 9.5"
This colorful pedicure perch will naturally trim your birds nails and help keep them trimmed. 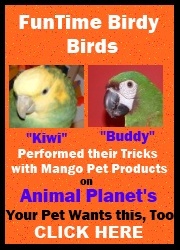 Perch varies in diameter from 3" down to 1 1/2" and is ideal for the largest of parrots. Pedicure bird perch measures 9.5" L with a variable diameter of 3" down to 1.5"
Product Reviews for Extra Large Pedicure Nail Trimming Perch for Macaws 9.5"
Extra Large Pedicure Nail Trimming Perch for Macaws 9.5"5Sunday BrownJune 2, 2017Aussie seems to really like this trimming perch! We are happy to have found you! Extra Large Pedicure Nail Trimming Perch for Macaws 9.5"5RayNovember 14, 2011My bird loves it! Extra Large Pedicure Nail Trimming Perch for Macaws 9.5"4Kary SchroederSeptember 25, 2011My Macaw Jasmine is staying with my parents for a while and there is no place to have her nails trimmed so I bought this perch for her. The perch works great but Jasmine does not prefer it so she does not stand on it as much as I'd like.